In 2012, the US Government cancelled a $5 billion camouflage project under which it had already supplied uniforms to soldiers in Afghanistan. 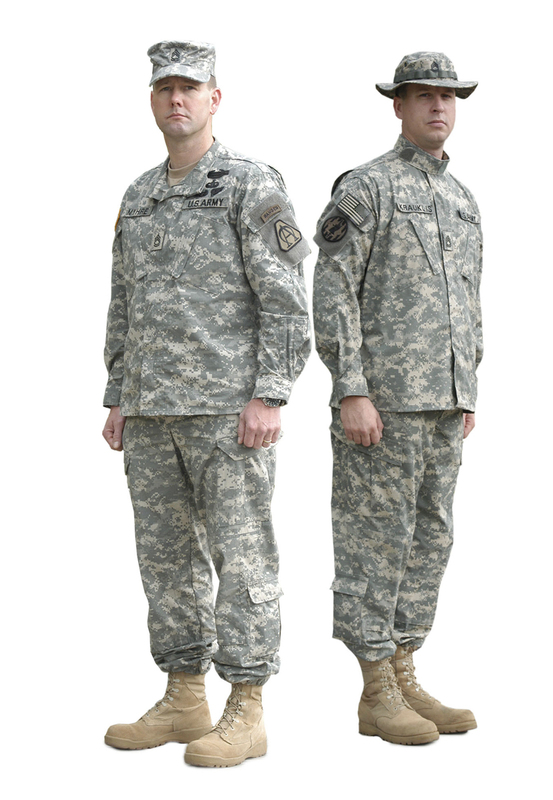 The pattern of camouflage, called the “universal camouflage pattern” (UCP) was supposed to allow soldiers to blend in equally well in forests, deserts, and urban environments but had been deployed but never properly tested to ensure that it provided proper protection. When this testing was finally carried out, it demonstrated that the camouflage performed poorly, and was actually putting soldiers at unnecessary risk. It got so bad that US Army soldiers were trading their uniforms with locals so that they could wear something with appropriate colouration. What this goes to show is how poorly we understand the mechanisms underlying camouflage, even while we spend enormous amounts of money attempting to exploit the phenomenon. A new paper that my colleagues (based at Carleton University) and I published today in the Royal Society journal Biology Letters adds a key piece to the camouflage puzzle by illustrating for the first time the mechanism behind “disruptive colouration“. The paper can be viewed for free at the journal homepage, as can all Biology Letters articles, until 30th November 2013 – go browse, it’s a fascinating journal with short, varied, interesting papers. 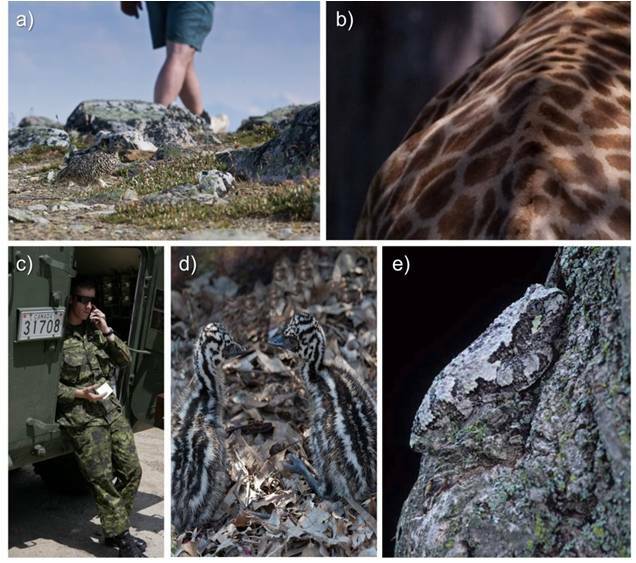 (a) White-tailed Ptarmigan Lagopus leucura, (b) Marai giraffe Giraffa camelopardalis tippelskirchi, (c) Canadian Disruptive Pattern (CADPAT), the world’s first digital camouflage, (d) emu chicks Dromaius noaehollandiae, (e) tree frog Hyla versicolor (Photographs by Michael Webster (a-d) and Michael Runtz (e)). We tested this theory using human participants hunting for computer-generated moth targets on images of trees. The moth targets varied in the degree of background matching and disruptive colouration, and by looking at the numbers of moths of each pattern that were detected we could infer the protective role of that particular pattern. However, a key step forward was the incorporation of eye-tracking technology. We tracked the eye movements of each human participant so that we knew exactly where they were looking (the machine recorded eye location 60 times per second!) so we knew when people were looking at the moths but not seeing them. When we looked at the number of times people passed over targets, and the amount of time taken to finally “attack” the target after finding it (i.e. the delay before finally recognising a moth), these also increased significantly with the edge pattern of the target. From all of this we can conclude that disruptive colouration is independent of background matching, and confers an advantage in terms of decreased detection and recognition of objects by visual hunters. Ours is the first study to demonstrate this important mechanism, and could potentially have wide-ranging implications for the design of military camouflage. We also provide one of the only uses of eye-tracking technology (an approach common in psychological research) in evolutionary biology, and I am certain that this will be an extremely valuable methodological advance moving forward. If you have any questions, feel free to tweet them (@katatrepsis) or leave a comment below! PS: Congratulations to the lead author, Dr Rich Webster, who successfully defended his PhD thesis a few days ago. Other photo credits: top image (soldiers) is public domain, bottom pair of eye-tracking images are Rich Webster’s.